I’ve written about fake ‘following’ and ‘liking’ within the WordPress.com environment before, but this time I’m going to be more direct, and give some insight into a regime of spam which I believe WordPress is fully aware of, condones, and even encourages. Even if you’re not a blogger, you should know about this, because ultimately, it can end up making very poor blogs appear popular. Why should that matter to you? Well, because if the search engines think a blog is popular, they’re more likely to rank it highly when you do a search on its subject. All that useless rubbish you find when you search for something of value – much of it is there because of fakery and spamming. If it wasn’t for spamming of one type or another, your search engine results would be far more consistently useful, and it would take you a lot less time to find the high quality material you need. No form of Internet spamming is in your interests as a Web surfer. So, when I say fake ‘following’ and ‘liking’, I mean that the ‘followers’ never read the blogs they’re following, and the people clicking the ‘Like’ buttons – invariably other WordPress bloggers – don’t read the posts they ‘like’. Why ‘follow’ or ‘like’ a blog if you haven’t read it and/or don’t intend to read it? Simple: because if you’re a WordPress blogger, then by default, each time you ‘follow’ or ‘like’ a blog on WordPress.com, the host sends an email to the person whose work you’ve ‘followed’ or ‘liked’, essentially promoting your work. With everything set to the defaults, every time you click those ‘follow’ or ‘like’ buttons, WordPress spams someone on your behalf. It doesn’t take long for certain ‘bloggers’ to realise that if they ‘like’ 200 WordPress posts in a day, their own ‘blogs’ will get a lot more visits, a lot more comments, and a lot more followers. This will almost inevitably lead, whether directly or indirectly, to a higher search status, and that means you, as a Web surfer, could be served up with the work of these spammers on the search engines, whether or not it’s any good. You might think that WordPress would have a rule against indisciminately clicking ‘Like’ buttons thousands and thousands of times purely to spam other bloggers, or a rule against people ‘following’ far more blogs than anyone could possibly read. But I’ve never seen a hint of any such rule. In fact, WordPress appears to have gone out of its way to make it more convenient for the spammers to spam people in this way. So much so, that the spammer doesn’t even have to visit a blog in order to spam its administrator. WordPress handily collates masses of infinitely scrolling blog posts, from assorted bloggers, in an ironically-named ‘Reader’ (in my experience it looks to be used for anything but reading). It then gives the spammers ‘Like’ and ‘Follow’ buttons, so they can literally hammer out their ‘like’ or ‘follow’ spam from a single screen. So, how about removing the ‘Like’ buttons from your WordPress blog then?… Makes no difference. The spammers are still given their own ‘Like’ and ‘Follow’ buttons, in the ‘Reader’ interface, regardless of your blog’s settings. You cannot stop WordPress spammers ‘liking’ your posts, or ‘following’ your blog, and there are no facilities to block anyone, or report them for spamming. Indeed, when people do report these spamming issues on the WordPress.com support forum, the threads are rapidly closed so they drop out of sight. Is WordPress conspiring to cover up this regime of spam in its own interests?... [UPDATE, 21/1/2013: for the first time today, I've seen WordPress advising those being spammed with 'likes' to use the Report Abuse function, and saying they'll at least look into any reports. But realistically, they don't need bloggers to tell them who the spammers are. I think this is just a bit of damage limitation in the face of growing calls for action]. If you dig deep into your Preferences you can change the default email option to prevent the spam emails, but that doesn’t stop WordPress sending notifications from these relentless spammers straight to your blog dashboard. The only way you can possibly avoid this spam, is if you resolve never to read any notifications at all. That’s impractical for most bloggers, so the spam can be considered unavoidable. BUT IS THIS REALLY SPAM IF YOU’RE GETTING FOLLOWERS AND LIKES? It is spam, because the ‘followers’ and the ‘likes’ are fake, valueless and meaningless. As a genuine blogger, you’re being patronised, by people who are perpetrating an emotional/egotistical scam. They’re not even specifically scamming you, because they’ve no idea who you are. They’re indiscriminate, and the only thing they’re focused on is clicking the buttons. The sole reason they’re clicking those buttons, is to send out emails en masse, with a view to promoting themselves. The classic definition of spamming. HOW CAN YOU TELL IF YOUR WORDPRESS ‘LIKES’ ARE GENUINE? It’s fairly easy to gain a sense from your daily stats of what proportion of your blog’s followers actually read your posts, but with ‘likes’ it can seem more difficult. What this does, is truncate the posts in your blog’s RSS feed. And what it means, is that when your posts are emailed to your ‘followers’, or (more pertinently in this instance) when your posts are sent to the WordPress ‘Reader’, only a small intro is supplied. Therefore, anyone finding your post in the ‘Reader’ will not be able to read more than the first two or three lines. If they want to read the post, they MUST click the link, which takes them to your blog. When anyone does click a link in the WordPress ‘Reader’ and lands on your blog, it’ll show up in the Referrers section of your blog stats. In the capture below, you can see how it’ll look. It has the WordPress logo, the WordPress.com link, and then the number of separate clicks you’ve had from WordPress. The example below shows a total of 3. On most days, I get zero, and judging from what I’ve read on the WordPress Support Forum, it would seem that’s pretty common. 1) The blogger who ‘liked’ your post is not following your blog. 2) There’s no corresponding referral showing in your Referrer stats. 3) The blogger who ‘liked’ your post has wildly different interests from yours. 4) Your post is new, and has been ‘liked’ before being indexed by the search engines. These are a few of the main indicators that WordPress ‘like spammers’ are at work. If another blogger has ‘liked’ your post before the search engines have indexed it, and he/she isn’t following your blog, and he/she doesn’t look to have matching interests, then realistically, if there’s no corresponding WordPress.com referral in your stats, this is almost inevitably pure spam. It’s nothing more than a “Hey, read my crap!”, from someone who hasn’t looked at your post, and is indiscriminately clicking ‘Like’ buttons in the ‘Reader’ - or using an auto routine. Over time – particularly if you have several WordPress.com blogs, you’ll start to see the same characters spamming you not just multiple times on one blog, but multiple times on multiple blogs. They don't know they're spamming you multiple times, incidentally, because they're just clicking buttons (or using a bot to do it for them) and they've no idea whose blogs the buttons relate to. I can easily see what these characters are up to – especially given the unnaturally high levels of attention their blogs are getting as a result. 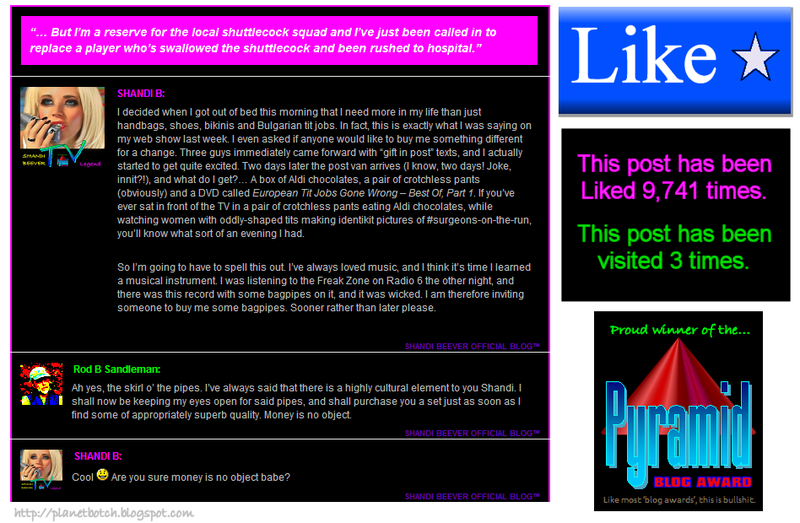 So, if I can see how relentlessly these people are hammering away at the ‘like’ buttons, then why can’t WordPress? The answer is, of course, that it can. WordPress must know full well that this regime of heavy, cynical spamming is running unchecked. Will they stop it? No. Because millions of deluded bloggers don’t realise it’s pure spam, and they actually think these slimy, annoying little weasels are reading and enjoying their work. That gives many genuine bloggers the impetus to write more content, which is of course in the interests of WordPress. If you do use WordPress.com, and you start to recognise this spam, don’t do anything to encourage the spammers. NEVER click through to their blogs from your email. If you want to visit their blog just for a sense of what sort of tricks they’re playing, copy their the blog address, go to Anonymouse, and paste it into the Anonymouse URL box. If you visit these characters’ blogs via Anonymouse it won’t register as a hit in their stats, so you’re not giving them any encouragement. It's also worth considering that fake 'likes' and 'follows' could be a lot more prevalent than you think. I can't be sure, of course, but I estimate that the proportion of 'likes' on my own WordPress blogs which have come from people who've actually read the posts, is less than 10%. In other words, I suspect that the vast majority of people clicking the 'Like' button on WordPress, have not read in full the material they've 'liked'. Citing a general figure for how many followers regularly read the blogs they follow I find more difficult, because I think it depends on the type of blog, and, in particular, the tags you use. If you use broad and popular keywords as tags (stuff like "entertainment", "music", etc), you tend to end up with a lot of fake followers who never read what you post. If, however, you use more obscure tags (local place names, niche interest commodities, etc), you'll probably get a higher percentage of followers actually reading your work. But by nature, using more obscure tags will net you significantly fewer followers in the first place. The only thing I can say with complete confidence is that visitors who land on your posts via the search engines are much more likely to read them than your blog 'followers'. But as a guide to a negative case scenario, I do have blogs whose new posts, I suspect, are read by less than 20% of their 'followers'. Ultimately, if WordPress.com is turning a blind eye to spammers, it's not only neglecting a responsibility to honest users - it's also consciously allowing the Web's qualitative indicators to be fudged. We all know that money will always come first for any business, and that some undesirables will be accepted. But spammers are not, in my view, acceptable. Is the Blogosphere Dead on its Feet? Establishing a Blog: Networking or SEO?